So for global mean SLR by 2100 they take into account a small chance of a maximum of 2208 mm and for local mean SLR they think this maximum is 2508 mm, if I understand their figure 7a correctly. It seems they don’t think 3000 mm of global (or local) mean SLR by 2100 is possible. Or do I miss something? Understandably, some individuals would like to have clear well defined probability density functions, PDFs, for SLR. However, I have previously stated that the current generation of models (Global/Regional/Local Circulation Models, GCMs, RCMs and LCMs) cannot yet adequately characterize the risk of the collapse of marine ice sheets and marine glacier (such as the Thwaites, other ASE glaciers, and indeed all WAIS marine glaciers), sufficiently to discount the risk of the partial collapse of significant portions of the West Antarctic Ice Sheet, with in one hundred years. Your are missing that in the first part of Figure 7, Lempert et al 2012 first extend Pfeffer et al 2008’s work (which does not include abrupt ice sheet collapse) to the situation; then in Figure 8 Lempert et al 2012 use statistics to include the risk of abrupt ice sheet collapse. First, In my response to Lennart, after the word “situation” I had meant to insert the words “for the Port of Los Angeles”. Nishina, K., Ito, A., Beerling, D. J., Cadule, P., Ciais, P., Clark, D. B., Falloon, P., Friend, A. D., Kahana, R., Kato, E., Keribin, R., Lucht, W., Lomas, M., Rademacher, T. T., Pavlick, R., Schaphoff, S., Vuichard, N., Warszawaski, L., and Yokohata, T.: Global soil organic carbon stock projection uncertainties relevant to sensitivity of global mean temperature and precipitation changes, Earth Syst. Dynam. Discuss., 4, 1035-1064, doi:10.5194/esdd-4-1035-2013, 2013. First signs of carbon sink saturation in European forest biomass; Gert-Jan Nabuurs, Marcus Lindner, Pieter J. Verkerk, Katja Gunia, Paola Deda, Roman Michalak & Giacomo Grassi; Nature Climate Change; Volume: 3, Pp:792–796; (2013); doi:10.1038/nclimate1853. Global warming amplified by reduced sulphur fluxes as a result of ocean acidification; Katharina D. Six, Silvia Kloster, Tatiana Ilyina, Stephen D. Archer, Kai Zhang & Ernst Maier-Reimer; Nature Climate Change; (2013); doi:10.1038/nclimate1981. Could you clarify for me how to read figure 8 in Lempert et ak 2012? It’s about the probability of a certain rate of ASLR starting in a certain year, but how can we deduce a total global mean SLR by 2100 from that figure, if at all? I do see in their table 1 that they seem to assume a (deeply uncertain) possibility of ASLR of 30 mm/yr starting somewhere between 2010 and 2100. So can we infer from this that they assume a possibility of 2700 mm of SLR between 2010 and 2100? Or put differently: how do you conclude from their figure 8, or otherwise, that they assume a possibility of 3 m of SLR by 2100? Ice-shelf buttressing and the stability of marine ice sheets G. H. Gudmundsson; The Cryosphere, 7, 647–655, 2013; http://www.the-cryosphere.net/7/647/2013/; doi:10.5194/tc-7-647-2013. 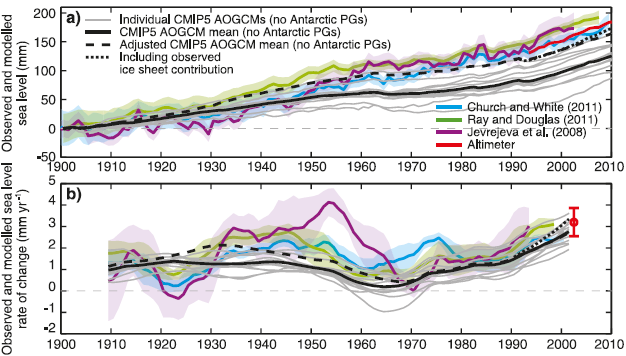 Pattyn, F., and G. Durand (2013), Why marine ice sheet model predictions may diverge in estimating future sea level rise, Geophys. Res. Lett., 40, doi:10.1002/grl.50824. Lampkin, D. J., N. Amador, B. R. Parizek, K. Farness, and K. Jezek (2013), Drainage from water-filled crevasses along the margins of Jakobshavn Isbræ: A potential catalyst for catchment expansion, J. Geophys. Res. Earth Surf., 118, 795–813, doi:10.1002/jgrf.20039. Where the first three terms are the well understood SLR (let’s say here AR5 RCP 8.5 SLR projection at the 83% Confidence Level, CL, ie from ocean water thermal expansion and ice mass loss from small glaciers = 980mm), and the fourth term is the uncertain abrupt SLR (from ice mass loss from ice sheets); where the terms are defined in Table 1 (e.g. the rate of abrupt sea level rise is c*, the year the abrupt rise begin is t*). Per Section 3.3: “Note that the condition c* > 14mm/yr + 0.3mm/yr(t*-2010) implies a sea level rise contribution from poorly understood processes of about 1400mm in 2100.” Furthermore, the text says that Figure 8 implies that there is a 14% to 16% probability of this being the case (ie say about a 84% to a 86% Confidence Level, CL). Thus combing the AR5 “Well-Characterized Uncertainty” upper end of the “likely” range (ie 83% CL) of 980mm plus the Lempert et al 2012 “Deep Uncertainties” “likely” value of 1400mm gives a “likely mean ASLR value” of 2380mm (2.38m) by 2100. However, many SLR experts believe that the AR5 SLR projects are too scientifically conservative (including NOAA), therefore, I believe that a mean ASLR range of 2 to 3m is reasonable (83% CL) for a BAU case. Thanks for the clarification, although I still find Lempert et al pretty hard to follow (probably due to my lack of scientific training). Other than that, i agree with your risk assessment approach and think we cannot exclude a risk of 2-3m of SLR by 2100, based on what several experts have said on this. Your comment about the fact that the AR5 SLR projections already include some SLR contributions from both the GIS and the AIS is very true, and raises the question as to what does “Well-Characterized Uncertainty” mean with regard to SLR contributions. Certainly the base PDFs for “Well-Characterized Uncertainty” SLR that Lampert et all 2012 used (by Pfeffer et al 2008 extended and by CO-CAT 2010) to determine the “Deep Uncertainty” SLR contribution, also included larger contributions from the GIS and the AIS than AR5 assumes. Thus by logical extension you are pointing out that my estimate of ASLR of between 2 to 3m by 2100 might be too low. Furthermore if you believe that the RCP 8.5 scenario is too low (because it does not include all of the methane emission sources, albedo flip, and other positive feedback factors that I mentioned), then it is not difficult to believe that this radiative forcing scenario could be increased by about 33%, which could increase the 95% CL mean global temperature increase from 6oC to 8oC by 2100. Thus if you both believe that the RCP forcing scenarios are 33% too low and that it is better to use Rahmstorf, Perrett and Vermeer (2011, see reference below)’s semi-empirical method for determining “Well-Characterized Uncertainty” SLR contributions (which also include contributions from the GIS and the AIS), then by 2100 one gets a 95% CL “Well-Characterized Uncertainty” SLR contribution of about 2.11m, to which the “Deep Uncertainty” contribution would need to be added. 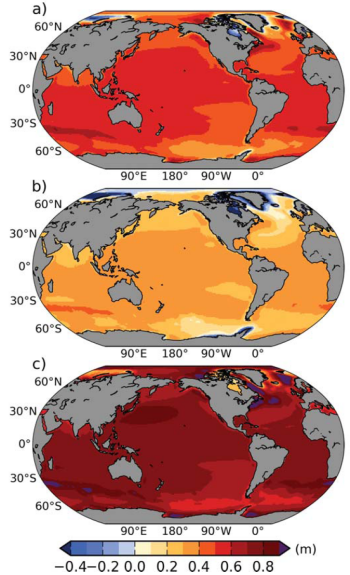 Rahmstorf, S., Perrett, M., and Vermeer, M. (2011), “Testing the robustness of semi-empirical sea level projections”, Clim Dyn, Springer-Verlag, doi: 10.1007/s00382-011-1226-7. Tebaldi, C., Strauss, B.H., and Zervas, C.E. (2012), “Modelling sea level rise impacts on storm surges along US coasts”, Environ. Res. Lett. 7 (2012) 014032 (11pp), doi:10.1088/1748-9326/7/1/014032. Now I see where are getting your numbers. Assuming a temperature rise of 6-8°C would generate higher values. Since these numbers are well above the highest estimates for the next century, it follows that 2-3 m would not be seen for centuries also. However, Lempert et al (2012) do not add any additional component for the risk of abrupt ice sheet collapse, they only add more thermal expansion, based on results from Sriver et al (2012), thus adding ca 20 cm to the upper limit in Pfeffer et al (2008). In addition they also add local effects (ca 30 cm), resulting in the graph in Figure 7. Regarding, Pfeffer et al (2008) it can be argued that they include some form of abrupt ice sheet collapse in Antarctica, as they assume accelerated discharges from WAIS. It is interesting to note that Pfeffer et al (2008) is often used as some kind of “upper bound” for SLR planning, but strangely enough they only include 30 cm for the thermometric component, while there are much higher figures abound. For example, IPCC (2007) go up to ca 45 cm and Katsman et al (2008) has 48 cm and Sriver et al (2012) 55 cm. In my post #213, I mistakenly state that Rogelj et al (2012) give values of 6oC and 7.5oC for the RCP 8.5 66%CL and 90%CL mean global temperature projections by 2100, respectively; when I should have said that Rogelj et al (2012) give values of 6oC and 7.5oC for the RCP 8.5 83%CL and 95%CL mean global temperature projections by 2100, respectively. However, if one were to assume that RCP 2.6 is no longer a valid scenario, then my original post is probably much closer to the truth than Rogelj et al (2012)’s values. I agree that in their Figure 7, Lempert et al (2012)do not add any additional component for the risk of abrupt ice sheet collapse to Pfeffer et al (2008) values. What I was trying to say is that in Figure 8, Lempert et al (2012) present probabilities for the risk of 1.4m of sea level rise contribution by 2100 due to abrupt ice sheet collapse. Also, while many people would agree with you that Pfeffer et al (2008) “.. include some form of abrupt ice sheet collapse in Antarctica, as they assume accelerated discharge from WAIS”, I would call that accelerated discharge from the WAIS “rapid ice mass loss” and not abrupt ice mass loss associated with “Deep Uncertainty”. Good points. As I said in reply to ASLR earlier, I don’t really understand figure 8 of Lempert et al 2012, but based on the opinion of several experts I think we cannot exclude a risk of 2-3 meters of SLR by 2100. Can we exclude more than 3m by 2100? I don’t know, but even 1.5m by 2100 would imply the risk of about 3-5m of SLR from 2100-2200, and maybe even faster SLR after 2200. So even then 3m of SLR could by passed (well) before 2150. Could the rate of SLR become as fast, or faster, as during Meltwater Pulse 1A, when it was probably as high as 4-5 meter/century? And how long could such a speed be sustained? So in principle, according to Hansen, an average rate of SLR of (at least) 6-8 meter/century could be sustained for centuries to a millennium. For shorter periods up to 1 meter/decade would then seem a possibility. Can we exclude such a risk? If not, it seems we should take such a risk into account in discussing options for mitigation and adaptation. (b) during the Eemain peak, and/or the Holsteinian peak, the WAIS likely collapsed abruptly, and that current collapse forcing conditions, equal or exceed those extant during the Holsteinian peak, and/or the Eemain peak. (2) The NEEM community members (2013) confirmed that the WAIS contributed close to 3.8m of SLR during the Eemian; which is much more than the 1.4m of ASLR contribution that Lempert et al (2012) address, see: NEEM community members, (2013), Eemian interglacial reconstructed from a Greenland folded ice core, Nature, Volume: 493, Pages: 489–494, doi:10.1038/nature11789. (b) I note that today on of the best examples of a strange attractor phenomenon (per Chaos Theory) that is not fully represented in current GCMs is the ENSO; while the following reference by White et al (2002) indicates that there is a positive feedback between the Antarctic Circumpolar Wave and the global El Nino-Southern Oscillation Wave; which provide historical evidence that non-linear atmospheric/oceanic interactions can further amplify the rate of future SLR: White, W. B., S.-C. Chen, R. J. Allan, and R. C. Stone, “Positive feedbacks between the Antarctic Circumpolar Wave and the global El Niño–Southern Oscillation Wave”, J. Geophys. Res., 107(C10), 3165, doi:10.1029/2000JC000581, 2002. (4) The WAIS Project Members (2013, see following reference) find that data from the “WAIS Divide Core” hole showed abrupt climate change that occurred in the past on timescales of decades (circa 20,000 years ago), and that these abrupt climate changes accelerated the de-glaciation of the WAIS likely due to interactions between the Southern Ocean and the ice sheet: WAIS Project Members, (2013), Onset of deglacial warming in West Antarctica driven by local orbital forcing, Nature; doi:10.1038/nature12376. Sure, but I was thinking of published scenarios that can be taken seriously by planners. Published scenarios are very important, as the examples of Pfeffer et al (2008) or Vermeer and Rahmstorf (2009) shows, being used all over the world. But neither of these really try to assess worst-case scenarios. It is harder to exclude impossible scenarios than to say what is possible. There is a strong bias in the literature against worst-case scenarios, and this is a very unfortunate situation, which I think will lead to many, many decisions all over the world, based on this biased information. Stein, S. and R. J.Geller, (2012), “Communicating uncertainties in natural hazard forecasts”, Eos Trans. AGU, 93(38), 361. The drainage basins determined by researchers around Antarctica are based on the areas that would drain out of a given gateway given the current ice surface gradients. One misconception worth discussing is that most researchers report the potential maximum SLR contribution from each of these basins as if the current ice surface gradients will be maintained into the future; which is not the case. For example it is frequently reported that the maximum SLR contribution from PIG and Thwaites Glacier are approximately: 9″ and 18″, respectively, and also many researchers project that ice mass loss from PIG may slow sufficiently in the next 5 to 10 years to limit the SLR contribution from PIG this century to an inch or two; however, as the Thwaites basin adjoins the PIG basin, should the Thwaites Glacier collapse as I have indicated may be possible; then it is possible that several inches of SLR of ice in the PIG basin could drain through the Thwaites Gateway. Such interactive logistics increase the likelihood that higher levels of SLR will occur by the end of this century; above that commonly thought likely. (1) Graphically, the Beta PDF from Figure 7 gives a 86% CL “Well-Characterized” SLR contribution of about 1.8m by 2100. (2) Figure 8 gives a 14% probability (or 86% CL) that the “Deep Uncertainty” SLR contribution by 2100 will equal or exceed 1.4m. (3) Combining these two 86% CL SLR contribution values (using only extended Pfeffer et al 2008 SLR assumptions, which you note is widely cited by planners), one gets a value of about 3.2m of SLR by 2100, which planners could take seriously if they so decided, if they chose to take responsibility for accepting the methodology used by Lempert et al 2012 to extend Pfeffer et al 2008’s SLR projections. Hoffman, J. S., D. Keyes, and J. G. Titus. 1983. Projecting Future Sea Level Rise; Methodology, Estimates to the Year 2100, and Research Needs. Washington D.C.: U.S. Environmental Protection Agency. 121 pp. During the last deglaciation increasing insolation in the Northern Hemisphere from about 20.000 years ago caused ice to melt, which lowered albedo and increased temperatures, which released GHG’s and melted more ice, which caused even higher temperatures, and so on, until insolation decreased again at the beginning of the Holocene about 10.000 years ago, which caused warming to stop and cooling to start. Roughly we can say that in about 10.000 years the planet warmed about 5 degrees C, CO2-levels rose about 100 ppm and sea level rose about 100 meters. On average temperature rose about 0.05 degrees/century, CO2-levels rose about 1 ppm/century, and sea level rose about 1 meter/century. Over this period lower albedo probably caused about the same radiative forcing as higher CO2/GHG levels. Today CO2-levels are almost 100 ppm higher than a century ago, rising at roughly 2 ppm/year, temperature is about 0.7 degrees higher than a century ago, rising at about than 0.15 degrees/decade, and sea level is about 20 cm higher than a century ago, rising at about 3-4 mm/yr. Albedo is decreasing. At this moment CO2 seems to be rising about 200 times faster than 10.000-20.000 years ago, temperature seems to be rising about 30 times faster, and sea level seems to be rising three times slower, so far. Albedo is decreasing, but it’s not clear to me how fast compared to this earlier period. CO2 rise, temperature rise, sea level rise and albedo decrease are probably all accelerating. The question is: will they accelerate in even proportion to each other, and what are the limits of this acceleration? Let’s assume that the current or near future climate forcing is indeed about 100 times as strong as during the last deglaciation. Will temperature and sea level rise then be about 100 times as fast as back then? If temperature rises about 5 degrees this century that would indeed be a 100 times faster rise than the 5 degrees rise from roughly 20.000-10.000 years ago. Could sea level then also rise 100 times faster than during this earlier period? I’ve not heard anyone suggest 100 meter of SLR would be possible in one century (apart from the fact there’s not enough ice for such a rise). But as quoted in my earlier comment: Jim Hansen thinks that 60-70 meters of SLR is possible, or even likely, in less than a millennium, under BAU forcing. That implies he thinks the average rate of SLR over the coming centuries could be up to about 10 times faster than during the last deglaciation, and about double the speed of Meltwater Pulse 1A. Does anyone here have reason to believe that Hansen’s estimate is too high, or too low, and if so, why? S. Jevrejeva, J.C. Moore, and A. Grinsted, Global and Planetary Change 80–81 (2012) 14–20. Can Planetary Wave Dynamics Explain Equable Climates?By: Sukyoung Lee, Steven Feldstein, David Pollard, and Tim White; May 3, 2010. Persistent near-tropical warmth on the Antarctic continent during the early Eocene epoch, by: Jörg Pross, Lineth Contreras, Peter K. Bijl, David R. Greenwood, Steven M. Bohaty, Stefan Schouten, James A. Bendle, Ursula Röhl, Lisa Tauxe, J. Ian Raine, Claire E. Huck, Tina van de Flierdt, Stewart S. R. Jamieson, Catherine E. Stickley, Bas van de Schootbrugge, Carlota Escutia, Henk Brinkhuis; Nature; 488,73–77 (02 August 2012); doi:10.1038/nature11300. The Early Eocene equable climate problem: Can perturbations of climate model parameters identify possible solutions?, by: by Navjit Sagoo, Paul Valdes, Rachel Flecker, and Lauren Gregoire; Royal Society Philosophical Transactions A; 2013. As far as I understand: Hansen argues that previous transgressions have been paced by the timescale of Milankovitch forcing and not by internal timescale of icesheet response, which could be smaller. As we see today under, geologically speaking, instantaneous, compared to Milankovitch, forcing, the internal icesheet timescale is indeed smaller. What it the upper bound on the internal icesheet timescale, how long does it stay around? ANDRILL indicates a millenium or so. That in itself, as Mr. van der Linde points out, is bad enuf. Hansen says a few hundred years. I tend to believe him, since we see already how fast the icesheets are responding. The recent results on sediment cores putatively dated to the PETM, indicating eyeblink fast geological change, is the only paleo example i am aware of that compares to the speed of human forcings. No large icesheet then, of course, too warm already. But there was a great dying then, too. A bi-annual report by the French Institute of Demographic Studies (INED, released in October 2013) projected that the world’s population will rise to 9.7 billion in 2050 from the current level of 7.1 billion and that India will overtake China as the world’s most populous nation. According to the report, the projected population of other countries in the world by 2050 (in millions) will be: Nigeria (444), US (400), Indonesia (366), Pakistan (363), Brazil (227), Bangladesh (202), Congo (182), Ethiopia (178), Philippines (152), Mexico (150), Russia (132), Tanzania (129), Egypt (126), Uganda (114), Vietnam (109), Iran (99), Japan (97), Kenya (97), Turkey (93), Iraq (83), UK (79), Germany (76), France (72), Sudan(69), Niger(66), South Africa (64), Mozambique (63) and Colombia (63). 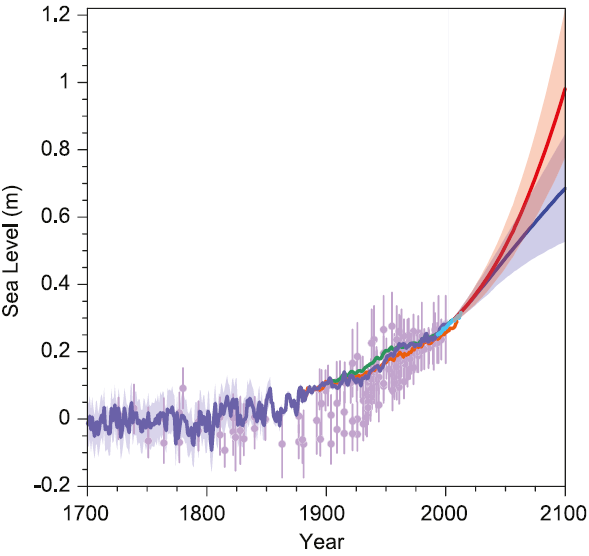 Due to the lag-time in the trend line for SLR, if all of these 9.7 billion people are not on their personal best behavior in 2050, then it is very likely that the 2100 SLR will exceed that projected for the RCP 8.5 95% CL radiative forcing scenario. Long-term CO2 production following permafrost thaw, Bo Elberling, Anders Michelsen, Christina Schädel, Edward A. G. Schuur, Hanne H. Christiansen, Louise Berg, Mikkel P. Tamstorf & Charlotte Sigsgaard, (2013) Nature Climate Change, 3,890–894doi:10.1038/nclimate1955. We use the depth-age relationship and borehole temperature profile from the WAIS-Divide ice core site to determine the basal melt rate and corresponding geothermal flux. The drilling of the WAIS-Divide ice core has been completed to 3400 m depth, about 60 m above the bed. The age of the deepest ice is 62 ka, younger than anticipated, with relatively thick annual layers of ~1 cm. The borehole temperature profile shows a large temperature gradient in the deep ice. We infer a basal melt rate of 1.5 (±0.5) cm yr-1 using a 1-D ice flow model constrained by these data sets. I recall posting a question on this board a few years ago asking whether the collapse of the Larsen B ice shelf came as a surprise to the experts. The responses indicated that the Larsen B event took the experts by surprise. Little hope perhaps that the concept of abrupt SLR may be viewed with the importance it deserves, because a consensus-driven agreement process would never admit to such processes. The concept is, in my view, very important because we have created nuclear infrastructure and systems at current sea level at coastlines whose life times are comparable to the timescales of SLR-induced impact. We have already witnessed ocean-mediated impact on one installation (Fukishima) and that is already stretching industrial capability to maintain semblances of safety in the Asia-Pacific and other regions. The topic of abrupt SLR goes to the heart of energy policy for a safe planet. (1) Increased advection of increasingly warmer CDW (causing accelerated grounding line retreat) due to such factors as: (i) increased El Nino frequency and intensity both with increasing global warming and the coming end of the current El Nino hiatus period; (ii) increased local upwelling and increased volume of CDW (circumpolar deep water) both due to increasing global warming; and (iii) increased saline pumping action due to increasing volume of ice mass loss. (2) Increasing formation of shear zone crevasses near the calving front of the marine glaciers [see Lampkin et al (2013) in my previous post], which may, or may not, fill with surface melt water depending on weather conditions (note that surface ice melt does current occur in the coastal region of the ASE during the peak of some austral summers, and that as the WAIS has one of the fastest rates of surface warming on Earth, it is safe to assume that the frequency of surface melting in this area will increase at a non-linear rate through the end of this century); which will clearly accelerate the rate of calving in these marine glaciers. (3) The basal friction in the Thwaites Glacier gateway region is believed to be one of the key factors currently limiting the further acceleration of ice mass loss from Thwaites Glacier; however, as: (i) the distribution of basal friction in the Thwaites Glacier gateway is not well known, this factor believed to limit ice flow acceleration may not be as effective in the future as is currently believed to be the case; (ii) as the ice in the gateway progressively thins it will eventually float over the top of the regions of relatively high basal friction, so eventually this limitation will be removed; and (iii) as the ice flow velocity increases the associated increase in basal melt water (due to increased melting of the glacial ice by internal and basal friction) will serve to lubricate and warm the basal ice thus reducing the ability of the basal friction to restrain further ice acceleration. (4) There is a prominent trough located on the western side of the Thwaites gateway (adjoining the Thwaites Ice Tongue, see following Tinto & Bell 2011 reference) that can serve to guide warm CDW directly into the heart of the gateway, once the ice in the trough has thinned sufficiently to maintain a subglacial cavity/void in the trough, which could then accelerate grounding line retreat in this area in a 2D (as opposed to the current 1D) manner. Tinto, K. J. and R. E. Bell (2011), “Progressive unpinning of Thwaites Glacier from newly identified offshore ridge – constraints from aerogravity”, Geophys. Res. Lett., doi:10.1029/2011GL049026. (5) Future changes in local coastal wind and associated local ocean current patterns due to global warming, could acceleration the advection of warm CDW into the ASE, thus inducing accelerated groundling line retreat for the affected marine glaciers. (6) Increases in tides/storm surge/storm tide and in local/regional SLR in the ASE due to accelerated ice mass loss from Greenland; should accelerate calving of the fronts of the ASE marine glaciers. (7) Parallel effect to Thwaites to the Jakobshavn Effect (see Habermann et al 2013, Walter et al 2012, and Van De Veen et al 2011) as soon as the Thwaites groundling line retreats to the lip of the Byrd Subglacial Basin, BSB. (i) Changing basal conditions during the speed-up of Jakobshavn Isbræ, Greenland, M. Habermann, M. Truffer, and D. Maxwell, The Cryosphere Discuss., 7, 2153–2190, 2013, http://www.the-cryosphere-discuss.net/7/2153/2013/, doi:10.5194/tcd-7-2153-2013; (ii) Oceanic mechanical forcing of a marine-terminating Greenland glacier, Jacob I. WALTER, Jason E. BOX, Slawek TULACZYK, Emily E. BRODSKY, Ian M. HOWAT, Yushin AHN, and Abel BROWN; Annals of Glaciology 53(60) 2012 doi: 10.3189/2012AoG60A083; (iii) Van Der Veen, C. J., Plummer, J., and Stearns, L.: Controls on the recent speed-up of Jakobshavn Isbræ, West Greenland, J. Glaciol., 57, 770–782, 2011. 2155, d o i : 10.3189/002214311797409776. Would another factor in the acceleration in the break down of the West Antarctic Ice Sheet be simply the ongoing rise in sea level from other sources. Then the rise in sea level from the West Antarctic ice shelf itself will accelerate its own break down. You mention that the rise in sea level could threaten island nations. This presumably is referring to coral atoll islands. While sea warming and acidification could certainly destroy atolls by killing corals, is it not true that sea level rise by itself is unlikely to do so and in this respect, the health of the coral atolls, short of warming or acidification, is in the hands of the local inhabitants. I am sorry, but I think it is you that are confused by the Lempert et al (2012) study. 1. They create a model (p 7) of future annual mean sea level z(t)=a+bt+ct^2+c*(t-t*), where the term a is the sea level anomaly at time zero (2011), b is a constant rate (mm/year), and c is an acceleration term (mm/year2), c* is the rate of abrupt sea level rise and t* is the year abrupt rise begins. 2. They construct two “extended scenarios” of local SLR in year 2100 (one is based on Pfeffer et al 2008 and one is based on CO-CAT 2010). These are represented as probability density functions in Figure 7. (The reason the extended scenario that is based on Pfeffer et al 2008 is ca 500 mm higher than Pfeffer et al 2008 is that they introduce uncertainty in the thermosteric component of -230 to +200 mm (Pfeffer has no uncertainty in that) and uncertainty from local circulations effects of -300 to +300 mm. They say that the resulting scenarios “range is also roughly consistent with the divergence of the simple parabolic fit to the local (PoLA) and global (Jevrejeva et al. 2006) observations extrapolated to the year 2100 (results not shown).” (p 19). 3. They make a “rejection sampling approach to approximate or emulate the resulting expert assessment for the projected sea level rise in the year 2100” (p 19). I am not sure how they do this exactly (elsewhere they talk about a “quasi-random Latin Hypercube sample” p 23). Anyhow, the end result is a ” joint distributions for c* and t*” (Figure 7 right pane) as well as a “a joint distribution for the parameters a, b, and c, which is largely uncorrelated with that for c* and t*, and thus consistent with that used in Section 3.1.1.” (note on page 19). 4. We get an indication of what the results of c* and t* are by looking at Figure 8, which I take show all the different variations of the c* and t* parameters that are consistent with the two extended scenarios. The colored lines show the decision-relevant conditions they are interested in. We don’t know what the other parameters (a,b,c) are, only that combinations of the parameters c* and t* on the red line means that the (a,b,c,) parameters are consistent with Section 3.1.1 and that this means “roughly 500 mm contribution from well-understood processes” (p 17) and ca 1400 mm of abrupt SLR by 2100 (coming from combinations of c* and t* at the red line). To conclude: if I am correct in my interpretation of their paper, they do not derive a scenario of 3.2 m GMSLR by 2100, as AbruptSLR says above. 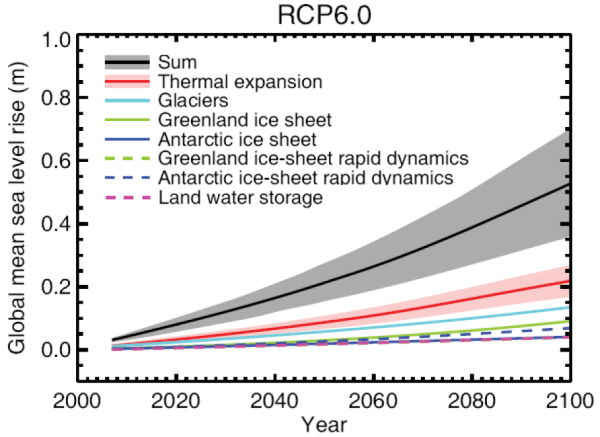 Instead they assume the two “extended scenarios” for local SLR shown in Figure 7 (suggesting a global mean SLR of 2.2 m and 1.7 m respectively), which they then use to deduce the policy-relevant parameters for abrupt sea level change (c* and t*). #231–A more sensible link than I expected, but I don’t think that we can assume the conclusion is correct. There is a severe potential issue with rate of change. It’s also a good example of the probable synergy between climate change impacts and other anthropogenic ones. Due to the gravitational “fingerprint” effect, when the WAIS loses ice mass, the local sea level drops; however, currently the GIS is losing ice mass faster than the AIS so the sea level around Antartica is currently neither going up or down (but this will likely change in the future). I have e-mailed one of the co-authors of the POLA SLR study, to see whether he is willing to resolve the correct intrepretation of their study.